We're All About First Impressions! 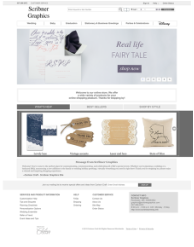 Visit our Carlson Craft Wedding Store by clicking the image above. ​is here to help you grow your business through innovation, print and social media; we do it all! Business consulting, professional design, print, and so much more! ﻿Please feel free to use the CONTACT button in the lower right hand corner for any questions. Feel free to use the CONTACT tab in the lower right for a needs assessment OR if you would like to try CONSTANT CONTACT for 60 days FREE OF CHARGE (no obligation to continue), click the FREE TRIAL located at the right. Scribner Graphics is also a Constant Contact Business Partner and Accredited Solution Provider.